Another one for those interested in agricultural history today and it is a whole series of books, rather than just one. Most family historians I speak to have agricultural labourers hidden somewhere in the boughs of their family tree. What we need to realise is that these are not some amorphous group whose experiences were all very similar. Farming practices differ according to soil, terrain and climate. The Book of the Farm, that I mentioned earlier in the month, is a general account; you also need something more specific. To find out what life would have been like for a farm labourer in a particular part of the country you cannot do better than consult the appropriate volume of the General View of Agriculture. These county volumes were commissioned by the Board of Agriculture and were produced on the cusp of the agricultural revolution, in the 1790s, although some ran to more than one edition. 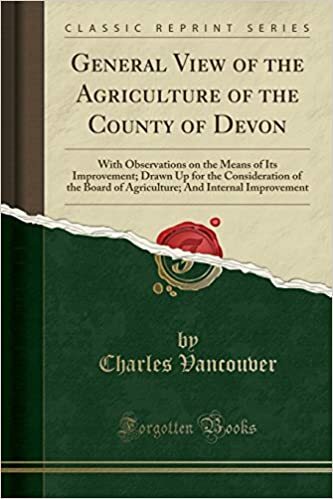 I have a facsimile edition of Charles Vancouver’s General View of the Agriculture of Devon with observations on means of its improvement. Vancouver wrote the second edition for Devon and was also responsible for some other counties. I can only write about the Devon volume but I suspect that the others are similar, as they were part of a national survey. The coverage is comprehensive and in the case of Devon, is broken down in to six regions, so the characteristics of a fairly small area can be discovered. The topics cover: soil, climate, crops, livestock, tools, terms of service for labourers, buildings, roads, markets and ways in which productivity could be improved. My edition had line drawings, a map and tables covering such things as parish by parish lists of population, amounts paid in poor relief, occupational structure, number of houses in the parish and other valuable goodies such as the menu for Exeter House of Industry (the forerunner of the workhouse) and the characteristics of different breeds of sheep. There are line drawings illustrating farm implements and livestock. In short, if you only read one book to help you understanding the farming practices of your ancestors, or your locality in the past, then it should be the appropriate county volume of this series. The full list can be found here. If all this sounds a bit too good to be true, it is because there is a downside. Although some of volumes are available as internet downloads, others have to be purchased in hard copy and are not always cheap. My advice is to shop around because you and your agricultural labouring ancestors, need these books. On the subject of agricultural labourers, for some strange reason, one of the most popular posts on my blog is one that I wrote about agricultural labourers. Every year there is a sudden spike in hits on this page via the site of an Australian University. I can’t see the actual page containing the link as it is in a ‘students only’ area but apparently they have been directed to me. I would have thought that there were far more in-depth accounts that they could go to but there it is. This entry was posted in #books and tagged #books, agricultural history, book review, Family History, genealogy, local history, social history.